1/2" ID x 1/2" Wide. It has 1.37 x 24 OD CW - right hand threads with the 3 Prong grove to drive a 16, 18, 20 or 22 tooth solid three prong sprocket and single speed freewheel. It can also be used with a 5, 6, 7 or 8 speed freewheel or a threaded track cog sprocket with 1.37 x 24 CW - Right Hand threads. It's a 1/2" wide, no set screw. Requires one 1/8" x 1/8" x 1" key not included. Held in place by snap rings or shaft collars. 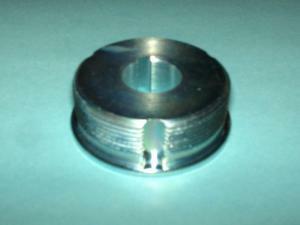 CNC Machined adaptor for freewheel sprockets, 12L14 steel and zinc plated. Used to drive the 20 tooth 3 prong solid sprocket and it also drive a freewheel sprocket, dual drive for the GIANT STILETTO kit and other uses.